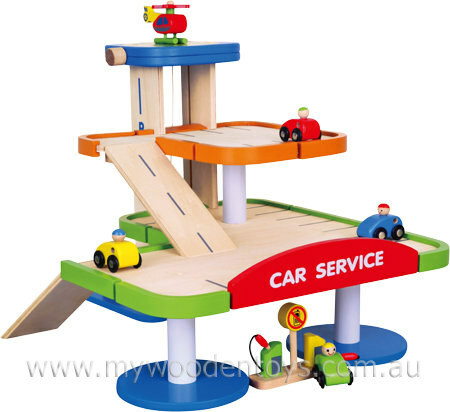 Wooden Car Park Garage is a beautiful multistory car park with 2 levels, a lift, ramps, petrol pumps, four cars and a heli-pad with helicopter. The lift operates by winding a knob at the top of the parking tower. The drive in lift allows you to drive your car in at the ground floor and then drive out the other side when you have wound the lift to whichever floor you want. The included little cars have holes so you can fit the petrol pump nozzle into them to fill up before you wizz off on your next driving adventure. This is a beautiful toy which will give hours of fun as you organise and re-organise your car collection and fly your helicopter. This Car Park is compatible with most collectable toy car ranges. We like this because: "Such a beautiful toy and lovely to see everything included"